PDA mobile inspection software generates effective forensic reports of detail information in TEXT or HTML file format. Pocket PC monitoring application displays cell phone information including contact details, messages status, IMSI or IMEI number, digital pictures and games etc. Windows mobile forensic software creates hardware information of cell phone including processor architecture, phone model number, operating system (type or version) etc. ...... Windows mobile inspection software basically used in crime investigation, Law enforcement units, forensic lab and other type of investigations etc. PDA mobile surveillance tool is compatible with all latest PDA and smartphone brands including Hitachi, HP iPAQ, HTC wizard, HTC Blue Angel, HTC universal reference, LG, Motorola, Motorola Q, Nokia N-series, i-mate jasjar, i-mate JAQ3, Toshiba, O2, Sony Ericsson, Samsung blackjack, Samsung UTStarcom, Pantech PH-S8000T, Yakumo PDA omikron etc. Pocket PC inspection application supports all windows operating system like windows Vista, XP, NT, ME, 98, 2000 and Server 2003. 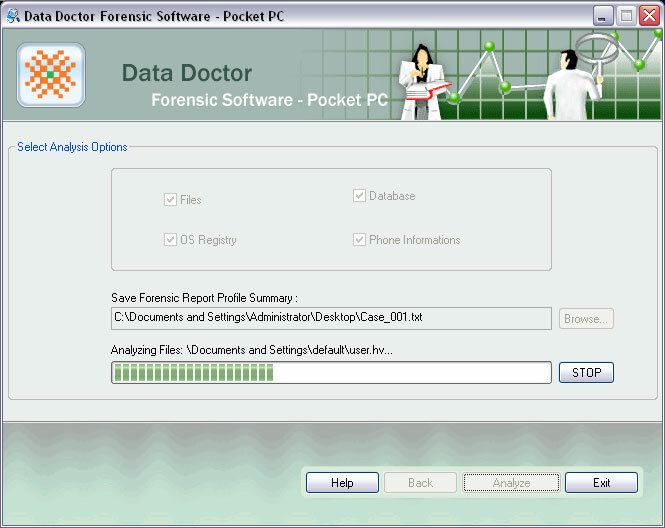 PDA mobile forensic tool provides user interactive graphical user interface and inbuilt help manual. Windows mobile surveillance software is very reliable, cost effective and secure tool. * PDA mobile forensic tool easily gathers cell phone information like files, folders, pictures, songs, games, txt documents etc. Qweas is providing links to PDA Mobile Forensic Tool 4.8.3.1 as a courtesy, and makes no representations regarding PDA Mobile Forensic Tool or any other applications or any information related thereto. Any questions, complaints or claims regarding this application PDA Mobile Forensic Tool 4.8.3.1 must be directed to the appropriate software vendor. You may click the publisher link of PDA Mobile Forensic Tool on the top of this page to get more details about the vendor.